Back at my parents’ home, we always had Pastirma one way or the other. My mum would make all types of egg with Pastirma for breakfast (omelets, scrambled and sunny side up). She would also make us amazing rolled labneh and Pastirma sandwiches, she would at times make the turkish pide with cheese and Pastirma and Pastirma sandwich, the boreks… You see we love Pastirma and we always had it at home and made best use of it. Jordan has a huge Armenian community, and as such we had access to amazing Armenian food. From Pastirmas to Sujuks and even dedicated Armenian restaurants, so we are very familiar and in love with Armenian Cuisine. Perhaps that is why my mum never had to make Pastirma herself, she would just buy the amazing ones sold in specialty shops. Living here however, you do not have access to those amazing varieties (of course, supermarkets have some Pastirmas but the processed commercial types, not the good stuff). So while you can carry some back with you if you wish, I was always looking for a more sustainable option. So over the years I have been experimenting with many recipes for making Pastirma at home, some were good, others failed stupendously! Until this happened! This recipe worked like a charm. It produced delicious Pastirma, the flavour is spot on and best of all the texture too is exactly right (was hard to achieve with other methods). 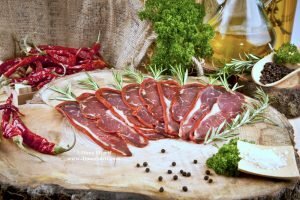 I am sharing it here with you as part of my website relaunch (giving you a very special recipe), so that you too can have great Pastirma back in your life if you live in an area where the premium stuff are not available. 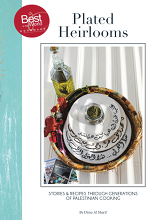 I am also sharing it with you because it falls under Mooneh (the pantry section of the kitchen), which we all know I love, it is what I do and so I am mostly focusing on that area! The whole idea is to give you recipes that bring back good food, good flavours and amazing food experiences to your kitchens. Real food knowledge and real food making. Nothing beats that, no matter what the trends are, a real cook knows real food and can actually cook. This is the aim here. I have also included for you a cheat Pide with Pastirma (Pide is the Turkish bread/pastry). It is a cheat because it is using a ready made pide instead of making it from scratch. I will share with you a from scratch Pide recipe soon, but for now, I wanted to show you how you can use this Pastirma. Apply the same to a pizza instead of pide, or to your bread doughs and pastries. The video is in Turkish, but it really is self explanatory, so language becomes obsolete in the presence of the universal food. And I just love that…. Make sure all the visible fat is trimmed off the fillet and cut the fillet into 2 equal pieces lengthwise. Pour a layer of sea salt in a deep flat plate/roasting tray and place the pieces on top of it. Make sure the fillet pieces are fully coated with a thick layer of the salt. Cover the tray loosely with a cotton cloth and place in the fridge for 3 days. After 3 days, the meat will have drained liquid and become dry, that is what we are looking for. So discard all the liquid and wash the meat with cold water. Fill a large container with cold water and submerge the meat, leaving to soak for 1 hour. Remove and pat dry the meat with paper towels, then wrap with a kitchen towel and place on a clean flat try. Top with another flat tray and weigh it down under a pot filled with cans or anything that will add weight. This is so the meat drains any absorbed water. Leave for 1 hour. (make sure that the AC is on if you live in a hot area, it is meant to sit at room temperature but that means 18-20 degrees C.
Once done, unwrap the meat from the kitchen towel and wrap each piece separately with a cheese cloth. then hang them in a cold, dry place or in the fridge (or cold room) for 2 weeks. Make sure to place a container underneath them to collect any drippings (if any). Simply mix all the ingredients together, with a little bit of warm water to form a paste. The mixture should be doughy and not runny as it will have to cling to the meat. Refrigerate this paste for 24 hours for the flavours to mature. The next day, unwrap the meat. The meat should now be completely dry. It will feel hard and will appear discoloured (dark on the outside). Cover the meat fully with the spice rub making sure it is all coated. Smooth the rub over then hang the meat again for 2-3 weeks. This last curing allows the meat to absorb all the aromas from the spice rub. Once done, and the meat is ready, slice into paper thin slices, the meat should have a dark rim yet still red on the inside.